If you remember from this post i recently went to the Xen Tan pop up boutique outside Selfridges in the Trafford Centre. I had a lovely consultation with Amy about my skin type and tan wants and both agreed that as i have already used the Dark lotion to try out the Xen Tan Dark Lotion Absolute Luxe Ultra Dark (Wow what a mouth full!) As i had just come back from one holiday and was about to venture on my next i agreed that this would be most suitable. I tested it out for the first time last week as my holiday tan was slightly fading and i wanted to share with you my thoughts. I used the Xen Tan Body Scrub just before applying the fake tan, which smells absolutely amazing, so fresh smelling and exactly like mint! It exfoliates well and doesnt contain any oils therefore helping to extend the life of your fake tan. Firstly, this smells amazing! It has a vanilla scent that seriously smells good enough to eat! However, once developed this tan does have that biscuity scent that does come with self tans but once showered and the guide colour washed off the scent goes. 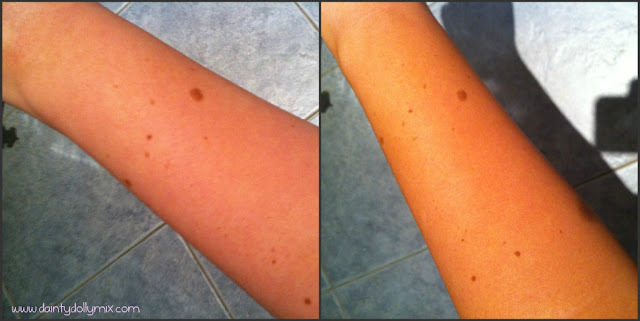 The application was so easy and simple,even for a fake tan novice like myself! It goes on quite thick and a little bit really does go a long way! It blends in really well and you can see where you have applied it even though there isnt much of a guide colour. I found that on myself it did take quite a long time to dry but application for my whole body only took 10-15 minutes, it was super fast! I applied it at night, just before bed and washed off in the shower the next morning. I found the lasting power of this tan amazing, im quite lazy and do like my tan to last a long time as usually they take forever to apply. It has been 9 days since first applied and i have literally just scrubbed the last bit of the tan off today. It didnt go patchy in the slightest and stayed consistent over the whole of my body. The price is the biggest issue for me as this product retails on the Xen Tan website for £39.99, I am too much of a Self tan newbie to justify spending so much on a fake tan when there are so many other brands and products that i am yet to try. However, a little google search shows that this product is available much cheaper (see the link below where it can be found for £25) which i would be happy to spend on this product. Overall, I am extremely impressed with this fake tan! I much prefer it to the Dark Lotion as i find the colour much more suited to be skin tone (Even though i am extremely pale!) and i find it a lot easier to apply as it is thicker and blends into the skin really well. It does have the fake tan biscuit scent which is the case for most fake tans but once rinsed off this disappears. It applies like a dream and extremely quickly and even though i am a fake tan beginner, i thoroughly enjoyed using this fake tan! It can also be used on the face, which i didnt do this time i just used a darker foundation, but i will definitely try this next time! The Xen Tan Dark Lotion Absolute Luxe Ultra Dark is available from the Xen Tan Website for £39.99 although it can be purchased from luxebc.com for £24.99. The Xen Tan body scrub is available from the Xen Tan Website for £14.99 and the tanning mitt is available from here for £3.99. Have you ever used Xen Tan tanning products? The St Moriz mousse is by go to tan... And you can buy it for £2 + p&p, so it's really cheap. I've tried St Tropez mousse and St Moriz mousse, and I honestly prefer the St Moriz one. I would definitely recommend it, it lasts well and is really easy to apply! Great review, the tan looks fab. Ohhh.. May have to try this stuff! I just tried this having used the dark lotion religiously. I have to say Im not that impressed so far. The bottle does say deep instant tan which you get with the dark lotion which means you can where it out while it develops, however this had no colour at all, infact when I was applying it it was white, like moisturiser. The colour isnt great either, its no where as dark as the dark lotion. I have tired literally all fake tans on the market from the cheap £1.99 bottles to high end £50 tans, and I do love Xen Tan but this product was not my favourite :( ! I'll try another layer tonight and see how it looks.